UMFULA involves over 50 people spread across 13 organisations based in five countries and two continents. In the history of collaborative research, there have been many research consortia of this size and geographical spread – but what makes UMFULA special is its interdisciplinary nature. UMFULA combines expertise in climate science, climate impacts, social science and communication with an external audience of end-users, i.e. people in the wider society for whom UMFULA’s research findings and recommendations are tailored. UMFULA researchers don’t just work in silos within their own discipline, however tempting this often is. They work together, using the information generated by one group to progress the work of another, towards a common outcome. The stakes are high. Development needs in central and southern Africa, where UMFULA works, are amongst the highest. More reliable and refined climate information is crucial in this region of high levels of climate variability. Malawi, one of UMFULA’s case study countries, is preparing for a general election in May this year and, while climate change may not at first sight hit the headlines, recurrent power cuts and tackling corruption and poverty are high on the list of the candidates’ promises to their voters. The recent flooding event and tropical cyclone Idai that hit the country might also impact the issues being considered during this election. Malawi is highly dependent on Lake Malawi to generate its electricity from hydropower and low rainfall in recent years has disrupted electricity supply. In Tanzania, UMFULA’s other case study country, projects to increase irrigated agriculture are potentially in conflict with projects to increase its hydropower capacity, which currently provides almost half of the country’s electricity. The challenges in both countries call for an integrated approach. We need climate science to understand present day variability and how the climate will evolve in the future; climate impacts to assess what this will mean for water availability energy and agriculture; and social science to understand the complex range of factors that influence decision-making (including non-climate factors, such as politics) and potential barriers to the use of new climate information for long-lived investments and plans. At the end of UMFULA’s penultimate year, the team gathered in Tanzania last November. The aim was to assess the work accomplished so far and, as part of this, we reflected on how we worked and what we could learn to inform the remaining time of the project (and future projects). Each team member was asked to indicate what they would stop, start and continue doing with respect to research and wider impact related activities. It was striking to see that apart from a few points, the majority of the responses related to collaboration and communication between team members and with stakeholders. How did we facilitate collaboration in UMFULA? Many of the tools we adopted to facilitate collaboration received overwhelming approval. These can be divided into collaboration within the project team and collaboration between the project team and external partners. Weekly and/or monthly calls take place within the climate science, climate impacts and social science teams to share updates, receive feedback on ongoing work and plan activities. These calls are led by the early career researchers; several of them told me they were a great opportunity for building capacity. We also organise calls by case study country to coordinate on activities such as fieldwork and strategy for stakeholder engagement, and to brainstorm on the latest policy developments. Dedicated time and space to work collaboratively is essential when various members of the team based in different locations work together on specific pieces of research. One post-doc from Oxford University spent a year with her climate science colleagues at the University of Cape Town, and the social science team held two writeshops, each resulting in the production of a paper (one of which has already been published in Environmental Science and Policy). In the same vein of bringing people together, the project’s annual meetings were found to be reinvigorating and essential to strengthen links between people who rarely meet in person. The success of a collaboration will not be determined just by the expertise and technical inputs of each collaborator, but also by the social connections and relationships which create the right environment for this expertise and these technical inputs to thrive. The latest addition at last November’s annual meeting was a pub quiz, tailored specifically for the UMFULA team, as a social and relaxing activity after a long day of work. Had we known before how positive an impact it would have created, we would have done it systematically in the previous three annual meetings. Collaboration with our partners is essential for an applied research project such as UMFULA,. Establishing solid contacts, engaging them throughout the project, addressing their needs and sharing results at all levels are all practices we have applied, specifically, but not only, through our co-production work undertaken in the Rufiji Basin and the Shire River Basin. A particularly-appreciated tool was our stakeholder updates. One page summaries of progress and planned activities are sent along with a personalized email to our stakeholders, tailored to each person and their interests which were determined at the start of the project. This simple and low-cost approach allows the establishment of solid contacts and contributes to a more interactive relationship with stakeholders. 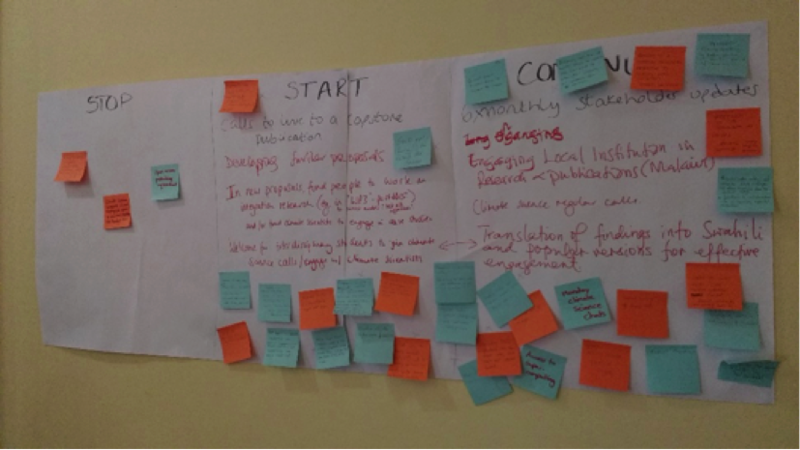 One recipient told us: “In most cases you find researchers not giving feedback regularly during their studies, but this has not been the case for you” (stakeholder in the Rufiji Basin, Tanzania, August 2018). Collaboration across disciplines has perhaps been our biggest challenge and biggest opportunity. It has a major bearing on whether or not we will meet our ultimate objective: communicating to our stakeholders tailored climate information for effective use in policies and planning. The whole chain of researchers is needed to achieve this: from climate science > climate impact > social science > communicating useful and useable information that can be used. Communication between each link in the chain is essential, as is a clear understanding of timing regarding when to expect inputs from others. It also needs time specifically allocated to the integration of the work and regular reminders of the overall purpose of this integration. In UMFULA, we have had dedicated calls and detailed discussions at each annual meeting. This has led to good progress, but a lot is still to be done. UMFULA is finishing formally at the end of the year but the willingness shown by many at the last annual meeting to continue working together beyond the end of the grant shows how strong the collaboration we have developed is. This to me certainly qualifies as a good impact. Another will be to see whether all the learning we have done will contribute to making collaborative working even more effective in future projects. This article was written by Estelle Rouhaud from the Grantham Research Institute on Climate Change and the Environment at the London School of Economics and Political Science. Estelle is the research manager of the Uncertainty Reduction in Models for Understanding Development Applications (UMFULA) research consortium. UMFULA aims to improve climate information for decision-making in central and southern Africa, with a particular focus on Tanzania and Malawi.